Whilst this small country in Central America does suffer from gang violence, for most tourists visiting, you're unlikely to ever encounter any problems. We had a long 6 hours layover at San Salvador airport, so we decided to venture out to see the country. The reports about how dangerous El Salvador is did make us worry for our safety, so we decided to search for a reputable tour company and do a layover tour with them. We found Salvadorean Tours on Tripadvisor and chose them because of all their excellent reviews. What impressed us the most was that upon arrival at San Salvador airport, they have a dedicated layover express desk who will meet you at the gate as soon as you get off the plane, then whisk you through customs, all the way to the exit to meet your guide. We've never seen that before at any airport! These are our 5 best things to do on your layover in El Salvador, to give you a flavour of what you can expect, and why you should also consider it, instead of waiting around for hours at the airport. After trekking the Rinjani volcano in Indonesia, we were ready to conquer another one. The Boqueron volcano dominates the skyline of San Salvador – the capital city of El Salvador. It's located in the Boqueron National Park at an altitude of 6,210 feet (1,892m), around 40 minutes’ drive from San Salvador downtown. The Boqueron is also called Quetzaltebec, named after the quetzal, which is the country's national bird. We hiked around the volcano crater in the Boqueron National Park, which has several viewpoints both into the crater below and also over San Salvador. The hike took around 1 hour, but you can also descend down to the volcano crater if you have time. Although the last eruption was in 1917, it's best to check the situation beforehand – a good local tour company will be the best source of this information. The Ancient Maya Civilisation thrived in Central America for over 3 millennia from 2000 BC until the arrival of the Spanish in the 1500s. Whilst most associate Chichen Itza in Mexico and Tikal in Guatamala as the most famous Mayan sites, there are several in El Salvador, which are worth seeing. Hoya de Seren is the most famous Mayan site in El Salvador and is a UNESCO listed site. It is often compared to Pompeii in Italy, and therefore nicknamed “the Pompeii of the Americas”. One of the highlights here are the remains of a farming community that have been preserved for centuries under thick layers of volcanic ash. Tazumal and San Andres are two other Mayan archaeological sites worth exploring in El Salvador. Tazumal has some of the best preserved Mayan ruins of the country, which includes pyramids, tombs and a complex drainage system. The San Andrés Mayan ruins include a large scale complex thought to have been part of a governmental building, and also has a museum with 3 galleries showcasing pre-Hispanic artefacts. We normally don't get particularly excited by churches, but the Iglesia de el Rosario (the El Rosario Church) in downtown San Salvador is the most unique we've ever seen and definitely worth visiting. From the outside it looks like a concrete airplane hangar with a dome shaped roof and a nondescript grey and red-brick construction. Inside it has a stained glass ceiling with a rainbow coloured glow. El Rosario Church was built by local sculptor Ruben Martinez in 1971 and it also has an art display of Martinez' interpretation of the last steps of Jesus, designed in just stone and rock. We found the whole thing extraordinary – definitely a hidden gem worth seeking out in El Salvador. Morro Horchata is a milky white refreshing drink in El Salvador, which is made from the seeds of morro – a green hard-shelled fruit that looks like a coconut. The Mexican version is completely different, usually made from rice. The black morro seeds are dried in the sun, then grounded into a powder, which is blended with water to produce the horchada. The drink is so popular that Salvadorian immigrants have recreated it in the USA, but altered the recipe to include peanuts, almonds, cashews, pumpkin seeds, cinnamon and sometimes using milk instead of water. Pupusas are the national food in El Salvador. They are stuffed tortillas traditionally made from corn, containing ingredients like cheese, beans and pork. It's so delicious that El Savadorian immigrants in the US established a National Festival on the 2nd Saturday of November to celebrate it. Pupusas can be purchased at a pupuseria where they are freshly made and most commonly available in the afternoon during rush hour when people buy them for a snack or for dinner. One of the best places to get pupusas is from Olocuilta town located near the airport, so perfect to stop at when finishing your layover tour. Here you can also try rice pupusas – they claim they invented it right here. If you miss out on this in El Salvador, there are several canteens at San Salvador airport which sell freshly made pupusas. 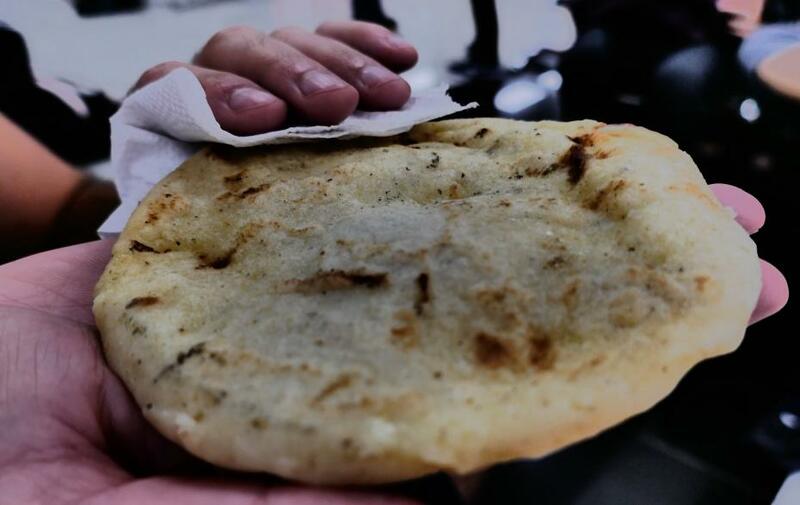 We believe that no visit to El Salvador is complete until you've tried a few pupusas! Freshly made pupusa: absolutely delicious! Sounds like some fun stuff to do around San Salvador. Our layover at the airport was not 2 hours; by the time we were processed and sat down, it was time to line up for our flight back to NYC. But we want to see more of the country. Especially because it is so tiny and genuinely, you can see and do quite a bit in El Salvador in a short period of time….unless you give into the danger and stay for months 😉 Love that it is getting better pub these days. Us tourists will rarely even see any indicators of violence because we are not staying in gang hoods. Great review guys!